A specific call to action to either donate money towards the cause and/or send the message to others who may be interested. An immediate means to donate funds via credit card linked directly from the post and processed through Amnesty International’s own website. Individuals who wished to support the cause could donate as little as £10 or enter their own sum. A social media sharing tool for readers to spread the word through Facebook, MySpace, Twitter, and other sites. The blogger, Mary, wisely didn’t assume that all of her readers would automatically know what those tiny social networking and social bookmarking icons at the end of most blog entries mean. Mary then continued to update the original blog post with fundraising results, and the organization even raised the monetary target once the first goal was reached. Additionally, a new blog entry was posted with more detailed updates, a real-time GPS tracking map of the ad-covered van, powered by InstaMapper.com, and fresh calls to action to keep the social media momentum going. Some of the specific suggestions Amnesty International gave to its supporters included sharing photographs of themselves with the print ad via Twitter with the hashtag #shellagm, and tweeting about the van sightings. 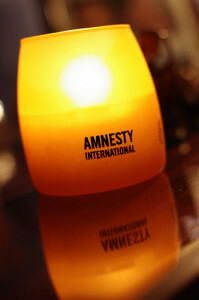 Image of Amnesty International candle by criminologue on Flickr, used under its Creative Commons license. 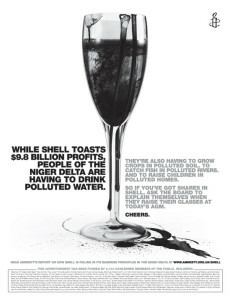 Image of Amnesty International print ad used under Fair Use: Reporting.